Unexploded bomb scare! Drama in Magpie Road! 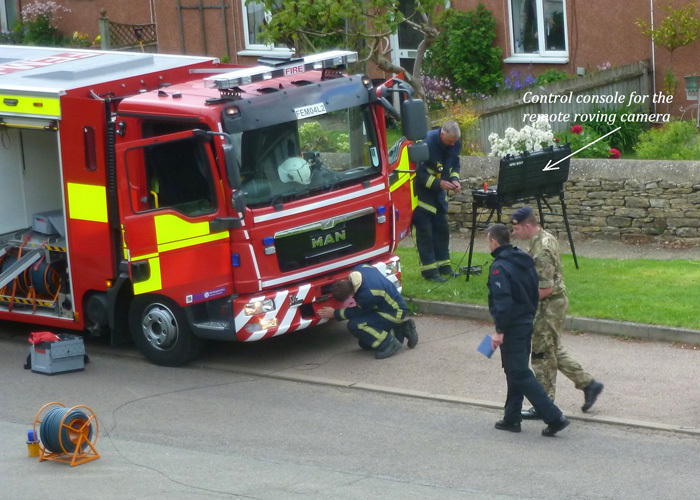 On Friday afternoon 22nd May the inhabitants of Magpie Road suddenly found fire engines and police cars outside their houses. 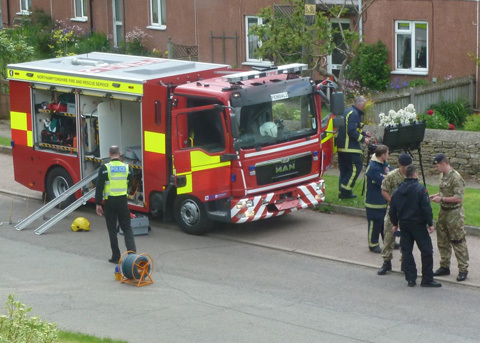 They were told by the police to stay indoors because of the discovery of a suspected unexploded wartime hand grenade on the side of the road, apparently dropped by a Council refuse lorry. 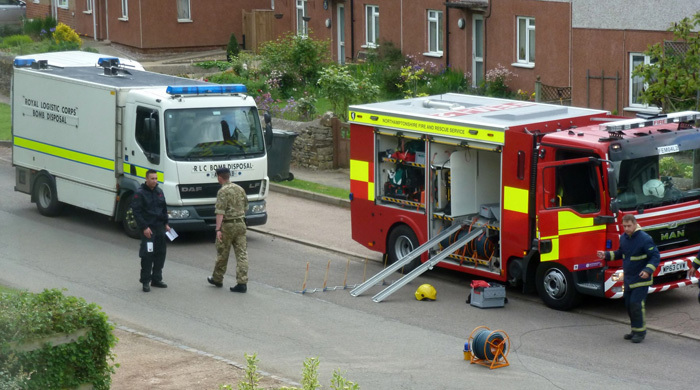 Until the device had been dealt with by an army bomb disposal unit no-one was allowed into the street. Peter and Clare Pollak had a similar experience on their return from holiday later in the afternoon. Their taxi was re-directed around Park Lane and they too entered their house from the back garden. Eventually the bomb disposal unit found the grenade to have been de-activated. It was taken away, the road re-opened and people allowed in and out of their houses. Thank you for your email and also the ‘follow’ on Twitter. I attended the incident and acted as overall Supervisor until an Inspector arrived. Essentially a hand grenade was located by refuse collectors and placed on the green whilst advice was sought. Any device of this nature will be treated by Police as ‘live’ unless there is 100% information to suggest otherwise. As such Police attended and closed the roads surrounding with a 200m (approx.) cordon. Members of the public living within that cordon and in their properties at the time were advised to remain indoors and to close curtains at the front of the house. Any person arriving after the cordon was initiated was not allowed to enter. Residents living outside the cordon were more than accommodating to these persons. Fire Service attended on standby should an explosion occur and brought with them some specialist equipment that allowed a remote camera to approach the device. Standard protocol in these types of situation is to call the Royal Logistics Core’s Enemy Ordinance Disposal team (EOD). EOD arrived and examined the device and determined that it had been deactivated. As such they removed the device and all cordons were removed. Risk to the public was minimal and the closure of the village centre necessary due to the potential harm that may have been caused had the device been live. All in all the events would have appeared very dramatic in a small village such as Sulgrave, especially given that a large device was in the process of being dealt with at the same time in London. Despite this all activity had the safety of residents as the most important consideration. The device had inadvertently entered the waste disposal system and the person disposing the item has been spoken to by officers. Can I take this opportunity to ask that you pass on our thanks to the residents of Sulgrave for their assistance in providing refreshments, accommodation for children stranded outside of the cordon after getting off the school bus and calm acceptance of the situation that befell them. This certainly made our job so much easier. So, well done everyone in dealing with the first such incident since bombs were dropped on nearby Culworth in 1940! This entry was posted on Thursday, May 28th, 2015 at 8:51 pm	and is filed under News. You can follow any responses to this entry through the RSS 2.0 feed. You can leave a response, or trackback from your own site.